Your guide, author Mike Fornes, has written two books on this topic and will give you, first and foremost, an outstanding talk about the Mackinac Bridge, Michigan’s crown jewel. The presentation is in student-friendly language that encourages questions about Michigan history and why the bridge was necessary. The talk combines engineering, geology, tasteful humor and of course Michigan history in a way that students and adults will enjoy. At one time it was the longest suspension bridge in the world – find out where there are bigger bridges today and why the “Big Mac” may still be a greater engineering feat! Hear the dramatic tales of the brave iron workers who built this massive structure, how several of them lost their lives in the process, and what safety procedures today are in place to protect motorists, workmen, and boaters. How many cars have gone off this span? The bridge is the safest five miles of Interstate 75, yet you will hear the stories of how it has been struck by a ship, an airplane, and how an Air Force bomber once flew under the bridge’s center span. Your guide will provide more than hearsay – in many cases these are eyewitness accounts of local history! 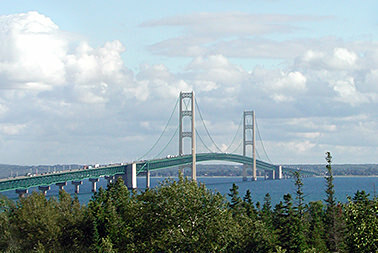 Many students may have walked the bridge during the annual bridgewalk, and will relate to the height of the span, weather conditions aloft and the distance across the Straits of Mackinac. If they haven’t walked it – they’ll want to after this presentation. 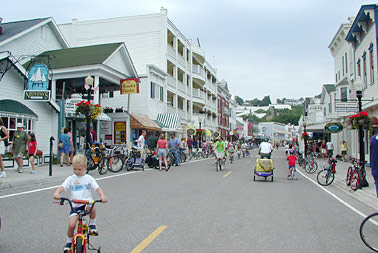 The program is presented in Mackinaw City at Old Mackinac Point Lighthouse, or in St. Ignace at Bridgeview Park. Students and adults should dress appropriately for weather conditions. This is a static shoreside tour and does not cross the bridge, permitting more fascinating detail from the guide and questions from students. Available at locations in Mackinaw City, Mackinac Island and St. Ignace, our guide takes your 3rd-8th grade Michigan History group to places they have only read about in their textbook, and has them search for items that Native Americans would have collected hundreds of years ago! By identifying certain trees, rocks, and other items common to the Straits Area, your students will forge an in-person link to their studies, their Michigan heritage, and team-oriented concepts which are needed in this exercise. 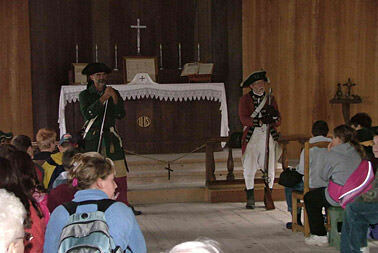 Students are easily within hearing range of a callback by the guide’s whistle. The guide carries 2-way radios for use by teachers or parent/chaperones. We supply all materials needed, students need only to dress appropriately for the day’s weather; the program is run on a “rain or shine” basis. Locales for this activity are close to town, yet “wilderness” in their settings. The guide explains each item to be found, and provides each group with a list for reference, complete with illustrations and a map of the areas to be searched and guidelines for “out of bounds” borders. 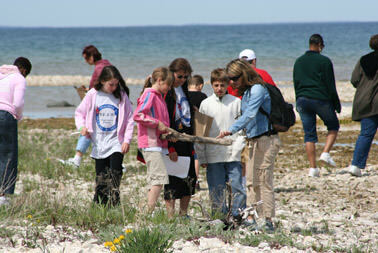 Upon returning, each student group will have found a variety of plant and geologic species common to this region, as well as fossils, driftwood, and other collectibles which chronicle Michigan’s evolution from the wild to areas populated by humans. Your students will not be bored! This is a great way to take the classroom outdoors to really bring Michigan History home. Your school’s 3rd through 8th-graders will be awed by their interaction with authentic Ojibway, Odawa and Chippewa descendants, clothed in colorful and traditional tribal wear. Much of the hand-made jewelry, clothing, and accessories will be available for a hands-on inspection by students. A variety of animal skins are displayed, representing the bounty of the fur-trading era in the Straits of Mackinac. The message of this popular program impresses upon youth many basic attributes of American Indian culture – the giving of gifts and respect for animals, nature and elders. Available outdoors at Old Mackinac Point, or indoors at your hotel’s breakfast room. A student-oriented storytelling session that highlights Native American Culture, lighthouse and shipwreck lore, and historic facts about the Straits of Mackinac and its eras of fur traders, voyageurs and lumber camps. Presented in an entertaining, kid-friendly dialogue. 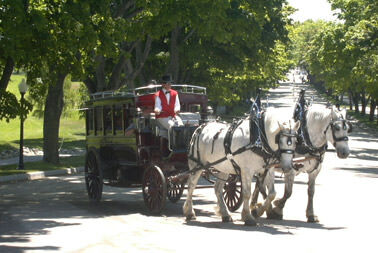 Evening presentations preferred, but can be added onto morning trips to Colonial Michilimackinac or Fort Mackinac. Colorful historic backdrops for this 45-minute interactive class are Marquette Park on Mackinac Island, the Marquette Memorial in St. Ignace, and Alexander Henry Park in Mackinaw City at the Old Mackinac Point Lighthouse. A perfect primer for the 4th grade Michigan History student, but an eye-opener for all!